Sublime for subtle sculpting, this soft bronze contour stick lets you chisel cheekbones, slim down your nose and perfect your jawline, without the painstaking process of all-out contouring. The cream-to-powder, long-wearing formula grants a natural-looking matte finish, guided by the dome-tipped shape to ensure smooth, targeted application every time. 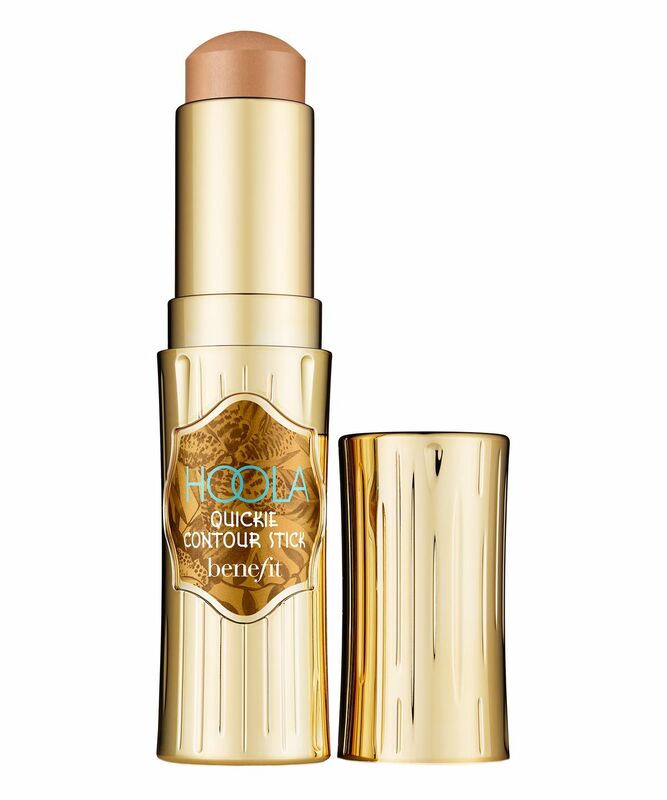 For subtle sculpting that’s absolutely effortless, Benefit’s Hoola Quickie Contour Stick will have even the most devoted contour artists neglecting their palettes. The beautifully bronze, cream-to-powder stick applies and blends seamlessly, leaving a soft matte finish that looks natural and lasts – thanks to the long-wearing formula. 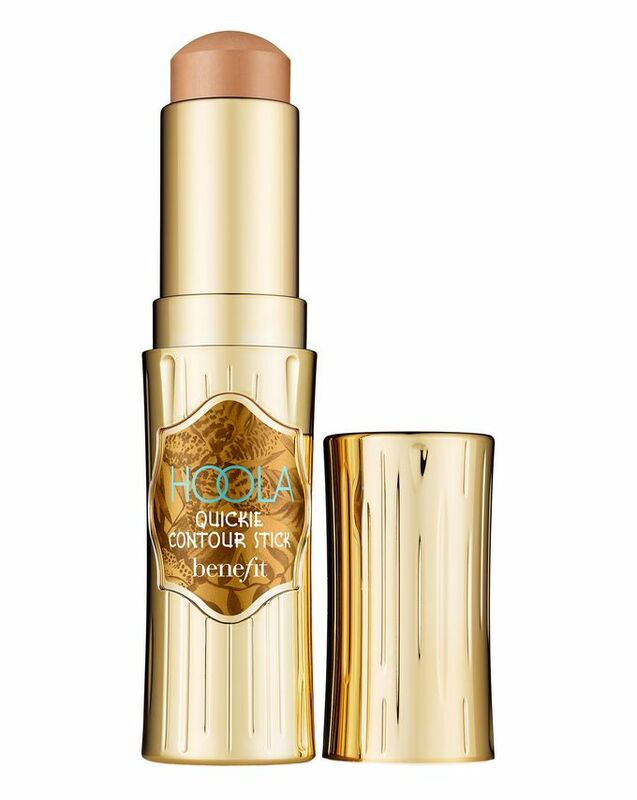 Chiselling cheekbones, slimming down noses and perfecting jawlines are all easy work for this super stick, which is topped with a dome-shaped dip to ensure smooth, targeted application every time you use it. Just apply it beneath your cheeks, blending up and along both sides of your nose, blending out. For more slimming action, use it on your hairline blending up and on your jawline blending down. Hydrogenated Polyisobutene, Silica, Bis-Stearyl Dimethicone, Diisopropyl Adipate, Dimethicone/Vinyl Dimethicone Crosspolymer, Polyethylene, Hydrogenated Palm Kernel Glycerides, Copernicia Cerifera (Carnauba) Wax, Caprylic/Capric Triglyceride, Phenoxyethanol, Tocopheryl Acetate, Euphorbia Cerifera (Candelilla) Wax, Silica Silylate, Isoceteth-10, Hydrogenated Palm Glycerides, Isopropyl Titanium Triisostearate, Triethoxysilylethyl Polydimethylsiloxyethyl Dimethicone, Aqua (Water), Tocopherol, Bht. [+/- : Ci 19140 (Yellow 5, Yellow 5 Lake), Ci 42090 (Blue 1 Lake), Ci 77007 (Ultramarines), Ci 77163 (Bismuth Oxychloride), Ci 77491, Ci 77492, Ci 77499 (Iron Oxides), Ci 77891 (Titanium Dioxide) ]. This contour stick blends easily without smudging foundation. However, the stick didn’t last long and the colour blends out into a very light colour which is barely noticeable. Good contour stick but the colour isn't great. PATCHY! I have seen bad reviews on this and wanted to try it for myself but I totally regret it.